NFC fatal flaws: Can Minnesota Vikings protect Kirk Cousins? Published: March 28, 2018 at 04:30 p.m. 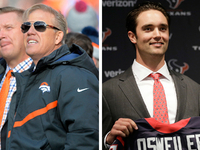 Updated: March 28, 2018 at 07:37 p.m.
With the primary and secondary waves of free agency in the rearview mirror, the NFL world turns its eye almost exclusively to the 2018 NFL Draft. Outside of trades, teams will mostly need to finish their efforts to improve through the college selection process. While many organizations took steps forward in free agency, every team is left with some number of holes. No one is perfect. Here we'll look at the fatal flaw remaining for each NFC franchise as we head toward the draft. If not addressed by rookies or internal improvement, these are the issues that could stall hopes for progress when the regular season begins in September. NOTE: Unless otherwise noted, any advanced metric used in this article comes from the Next Gen Stats tracking data gleaned from the chips embedded within every player's shoulder pads. Arizona will need to do some maneuvering to acquire a quarterback of the future in the 2018 NFL Draft. It's unlikely any of the top four (and maybe not even the top five) options will be available at the 15th overall pick. If the Cards don't secure a high-end rookie, they will likely have to make it work with Sam Bradford for an extended stretch. Bradford's major issue has nothing to do with his ability; rather, he's a long shot to ever stay healthy. That's a serious problem, with the Arizona offensive line as currently constructed. Cardinals quarterbacks were under pressure on 230 plays last season, the most of any team in the NFL. The team added Justin Pugh to solidify a guard position and Andre Smith to chip in at right tackle. Neither player changes the fortunes of a line that still looks like a liability. Solution: The Cardinals have more holes than they're commonly credited with, but they should still consider spending a high-priority pick on the offensive line. Arizona can hope D.J. Humphries grows into a high-end left tackle, but the Cards should at least find him a long-term running mate. Julio Jones is still an elite wide receiver, but the cupboard suddenly looks bare when you turn your eyes past him. Mohamed Sanu is a solid No. 2, but the Falcons could stand to upgrade on him -- or at least add another body to the mix. A vertical threat would be ideal for this team. Sanu averaged just 7.6 air yards per target last season and is strictly a possession receiver. Matt Ryan was the best deep-ball passer in the NFL in 2016, leading all quarterbacks with a 50 percent completion rate on throws that traveled 20-plus air yards. His output cratered in 2017, as he completed just 25.5 percent of those throws. Atlanta should look to inject a breath of fresh air into its pass-catching corps in April, with an eye toward a downfield weapon. Solution: If Calvin Ridley slips at all due to some poor results in the jumps at the NFL Scouting Combine, the Falcons should run the card up to the podium. With his separation ability, Ridley would be the ultimate complement to Jones and could feast on No. 2 corners. 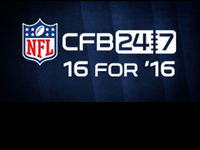 With a major fall unlikely for the Crimson Tide wideout, the Falcons can look for a big-play receiver in Round 2. Someone like Courtland Sutton, Equanimeous St. Brown or D.J. Moore could change up this passing game. The Panthers added Torrey Smith and Jarius Wright over the past few weeks to compete as the deep threat and slot receiver, respectively. The team will also welcome back speedy receiver Curtis Samuel after an injury-ravaged rookie season. All of that will help, but these are just pieces to a puzzle that was utterly broken last season. Given how absent their downfield passing game was in 2017, the Panthers cannot possibly be done at the position. Cam Newton had a miserable 9.8 passer rating on deep throws (20-plus air yards) to wide receivers last season; his overall passer rating on such throws fell from 92.3 in 2016 all the way to 44.5 this past year. The Panthers are never going to be a precise, timing-based passing offense with the way Newton approaches the game. So, if the deep shots are also absent from the offense, this unit won't scare many opponents. Solution: The Panthers need to spend a first- or second-round pick on the wide receiver position. Teams like the Rams, Bears, Chiefs and Eagles are showing the value in almost going overboard to surround your young quarterback with a bevy of skill-position talent. Carolina never did that in Newton's youth, but can still make up for lost time. The Panthers have real interest in D.J. Moore, as they flew Norv Turner and wide receivers coach Lance Taylor to his pro day. If he's still on the board at No. 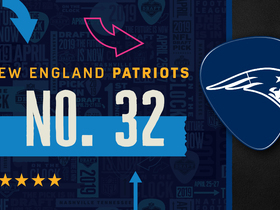 24 overall -- and I'd forecast he won't be -- I think he has strong odds to be the pick. James Washington out of Oklahoma tracks the deep ball better than any player in the class and was more than comfortable operating in tight spaces in college. He'd be a fine fit with Cam Newton. The Bears put the full-court press on solving their pass-catcher issues in free agency. With that done, the team can turn its attention to fine-tuning an already-respectable defense. Chicago's stop unit has talent at all levels, but could really benefit from a face-of-the-defense type of linebacker in the mold of the many to take Soldier Field in seasons past. The Bears totaled just 193 run stuffs last season, ranking in the bottom five, and would benefit from the addition of a second-level defender who can fly around the field. A steady linebacker would also improve the pass coverage, where Chicago gave up the highest catch rate (80.8 percent) in the league last year when a linebacker was the nearest defender. Solution: Tremaine Edmunds would be a slam-dunk pick at eighth overall in April's draft. He's the blend of all-around linebacker who can cover, rush and fly to the football. A player like that changes the tone of a defense with his mere presence in the middle, a la Luke Kuechly in Carolina. Daniel Jeremiah has Edmunds as the No. 5 overall prospect on his big board -- this LB would be well worth the cost of a top-10 pick. Whereas many teams with a young, cost-controlled starting quarterback are going all out to make sure he's surrounded by high-end skill-position talent, the Cowboys insist on making Dak Prescott's life difficult. He gets the benefit of playing behind a good offensive line and alongside a dynamic running back, but Prescott plays in a system that is now bereft of difference-makers in the passing game and rarely gives him lay-up throws. Prescott has thrown 20.3 percent of his passes into tight windows over the last two seasons, the seventh-highest rate among quarterbacks with 500-plus attempts. Amazingly, only four passers have a higher rate of tight-window throws on short passes (9.0 air yards or fewer) over the last two years. Prescott has been effective on those throws overall, but it's time for player additions and philosophy changes to make operating this offense a less burdensome task for the 24-year-old. Solution: The Cowboys should begin the search for Jason Witten's replacement and could even get aggressive with a tight end like Dallas Goedert early in the draft. The 'Boys should also consider replacing Cole Beasley at slot receiver. He averaged 2.5 yards of separation on his targets out of the slot, ranking 34th among receiver to see at least 30 targets from the inside. D.J. Moore has the ability to play flanker and slot. He would be everything the Cowboys need and should be on their mind when the clock starts ticking on the 19th overall pick. Christian Kirk of Texas A&M would also be a positive addition. The more time that passes since the end of the regular season, the more the Next Gen Stats data makes clear to me how incredible Matthew Stafford's season was. The Lions starter ranked as the second-best deep passer and tight-window thrower in 2017. It's time to get this passing game some help. The Lions haven't had a running back rush for 100 yards in a game since current NFL Network analyst Reggie Bush did it on Nov. 28, 2013. The 2017 RB corps averaged just 3.2 yards gained after defenders closed within 1 yard, which ranked 30th in the NFL. Theo Riddick's excellent work on passing downs doesn't carry over to rushing plays, while Ameer Abdullah just doesn't make people miss like he did in college. Detroit acquired LeGarrette Blount, who will no doubt help on early downs, but more moves must be on the horizon. There are other holes that need patching on this team, but it's time the Lions solve this ground issue. Solution: The team could get aggressive and take a running back like Nick Chubb or Derrius Guice at No. 20. Bringing balance to this offense might be that appealing to them. On the other hand, Detroit could wait until the second day and add a player like Rashaad Penny. The San Diego State product would bring a dynamism we haven't seen in this backfield in years. The Packers finally put an end to the Dom Capers era of middling defensive performance, hiring Mike Pettine as the new defensive coordinator. A change in scheme will help, but Green Bay should continue to add to a secondary that was far too often torched in 2017. The Pack gave up an NFL-high 106.2 passer rating when a cornerback was the nearest defender last season. Tramon Williams was brought back for his second go-round with the team after Green Bay shipped former starting cornerback Damarious Randall to Cleveland. Williams was quietly excellent with the Cardinals last year, solidifying the outside corner spot across from Patrick Peterson and allowing a 44.0 passer rating in coverage. However, Williams just turned 35 and he's the only competent cornerback on the roster outside of former 2017 second-round pick Kevin King. The Packers not only need more options to hit the field when they go to their nickel and dime package -- they need a plan for the future. 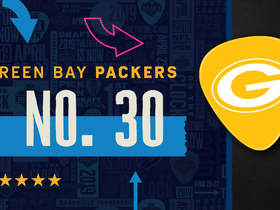 Solution: Lance Zierlein and Chad Reuter have the versatile Minkah Fitzpatrick of Alabama sliding to Green Bay at the 14th overall pick in their latest mock drafts. Fitzpatrick could help the team out as a nickel defender and take away slot receivers. If the Packers don't find a corner option they like in Round 1, they can address the pass rush there and circle back for options on Day 2. The Rams are one of many teams that made a flurry of moves to acquire veterans in an effort to patch up the vast majority of holes on their roster. As a result, they have one of the more frightening pass defenses in the NFL on paper. However, none of their offseason moves helped to bolster a linebacking unit that was already an issue last season -- even before the team sent Alec Ogletree packing. Los Angeles' linebackers converted just 50 percent of the instances where they closed within 1 yard of a running back into a tackle. That tackle-conversion rate was dead last among NFL defenses. While the Rams seem content to sacrifice their ability to be a dominant run defense in order to build a monstrous pass rush and secondary, it would be wise to at least bring in a few more options at this position. 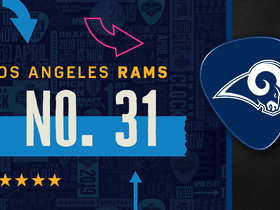 Solution: The Rams pick at 23rd overall in the first round and could find options like Rashaan Evans and Leighton Vander Esch appealing at that juncture. If they eschew valuing this position as they have in free agency, expect them to consider linebackers of the two-down-thumper variety in the third round and beyond. The Vikings received overall strong play out of their 2017 offensive line, especially in the ground game. But the team did show some weaknesses in pass protection, allowing the ninth-highest pressure rate (29.8 percent) in the NFL. Minnesota also saw a starting interior lineman in Joe Berger opt to retire, putting the right guard position in question. They allowed the majority of their pressures (92) from that side of the offense last year. The Vikings don't have many glaring needs to fill on the roster and should be aggressive in finding a solution on the line during the upcoming draft in order to maximize their investment in Kirk Cousins. For all the good he brings, Cousins will struggle with defenders in his face and threw an NFL-high eight interceptions under pressure in 2017. Solution: The Vikings will have some options available to them late in the first round. Players like Will Hernandez and Isaiah Wynn would fit the type of identity the team looks for on the line. Wynn primarily played left tackle for Georgia, but Daniel Jeremiah believes "he has Pro Bowl ability" if kicked inside. The Vikes experimented with deploying Mike Remmers at guard last season, albeit to mixed results, and could go for a right tackle if they want to leave him there. Outside of Michael Thomas and Ted Ginn as a pure speed threat, the Saints are quite light on pass-catching options. One spot the team could certainly stand to upgrade on is tight end. For all the greatness Drew Brees has given us in the twilight years of his career, one area where he hasn't stood as strong is tight-window passing. Brees ranked 19th with a 49.8 passer rating on tight-window throws this past year, which was a slight decline from his 16th-place finish in 2016 (59.8 rating). A big-bodied tight end who can box out opposing defenders would go a long way to taking some of the burden off Brees on these types of passes. Brees already completed 73.8 percent of his middle-of-the-field throws last season, so another threat in this part of the field would be a natural fit. Yes, New Orleans just brought back Benjamin Watson, but he's 37 years old. The Saints still need a long-term answer here. Solution: Mike Gesicki was born to play in the Saints offense. The hulking Penn State tight end put on a freaky performance at the NFL Scouting Combine. He displays the type of athleticism that should remind viewers of another athletic tight end who used to catch passes for Brees a few years back: Jimmy Graham. The Saints should strongly consider snagging Gesicki with the No. 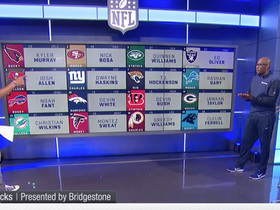 27 overall selection in order to maximize their already dangerous offense. The Giants already ranked 32nd last season with just 146 pressures -- and that was before shipping Jason Pierre-Paul off to Tampa Bay. New York is frighteningly thin at edge rusher, with little depth behind starters Olivier Vernon and Kareem Martin. On the inside, Damon Harrison is a true weapon against the ground game and led all defensive players in run stuffs last season. However, the Giants got next to no interior disruption against the pass in 2017. New York's interior defensive linemen checked in with a 7.5 percent pressure rate, good for dead last in the NFL. It won't matter what other changes the team makes on defense if Big Blue can't put more heat on opposing quarterbacks. Solution: The Giants seem unlikely to address this need at the second overall pick unless they surprise and go with Bradley Chubb. So they'll likely double back for D-line help at the top of the second round. Dave Gettleman could target a player like Taven Bryan. Daniel Jeremiah believes Bryan "has Pro Bowl-caliber traits and could emerge as a premier interior pass rusher" and ranks the Florida product as the No. 24 overall prospect in this class. Honestly, New York can't go wrong with either an interior or edge pass rusher at the 34th overall pick -- the need is that dire. 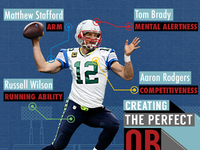 The Super Bowl champions are talented, of course, but they're also an incredibly deep team. It's tough to find many holes on this roster, much less a "fatal flaw." They've added to a defense that harassed quarterbacks and suffocated running games like no other last season. All the key skill-position pieces to their thrilling offense are set to return. If there's one area the Eagles could stand to further fortify it's their future at left tackle. As of now, Jason Peters is set to return to the team after playing just seven games last season before going down with a serious knee injury. His backup, Halapoulivaati Vaitai, had an excellent playoff run, but the left side of Philly's line was an issue during the regular season. The Eagles allowed the fifth-highest pressure rate (11.9 percent) from the left side. Vaitai will also be a free agent after the 2019 season and Peters will be well into his late 30s. At that point, Philadelphia would be wise to have another option in-house to assign the task of protecting Carson Wentz's blind side. It's a nice life when you have to stretch this far to identify a "fatal flaw," but being this loaded allows Howie Roseman and company to plan for this roster's future. Solution: The Eagles don't need an immediate-impact rookie to come from their first-round pick this year. 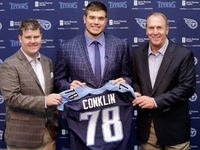 If a tackle prospect like Kolton Miller or Mike McGlinchey is available at the 32nd overall pick, snagging an OT to groom for 2019 and beyond would be a wise move for the forward-thinking Eagles. The 49ers' roster has come a long way in the last calendar year -- to the point that it takes a few glances to find a true concern. We know this team is ready to push for a top-10 offensive ranking with Jimmy Garoppolo at the helm in 2018. However, if there's one area the Niners could tighten up, it's right tackle. The team is likely to have Trent Brown and Garry Gilliam listed at that spot on the depth chart headed into camp. More competition would be a welcome sight. San Francisco running backs averaged just 3.2 yards per carry when running to the right last year. Only the Lions checked in below that. The 49ers' pass-protection issues also started on that side of the line, as their 109 pressures allowed were the fourth-most for any team's right side. Having a sturdy player at RT will make life easier for the team's new franchise quarterback, as well as big-money free-agent addition Jerick McKinnon. Solution: The 49ers are unlikely able to pass up marquee defenders like Derwin James, Denzel Ward and Tremaine Edmunds if they're available at the ninth overall pick. However, if they can entice a team to trade up to that pick for a quarterback, then you could see them slide back in the draft and target a starting right tackle. If not, John Lynch and company have picks in both the second and third rounds to find a player to compete on the line. This team can't seem to quit its desire for the brand of physical ground-and-pound football that brought Seattle success when Marshawn Lynch was in town. Yet, the 'Hawks have shown no ability to create the type of soil needed to plant those seeds. Seattle's offensive line is annually among the least-inspiring units in the game -- and last season was a low mark, especially in the ground game. Seahawks running backs gained an average of -0.11 yards before defenders closed within 1 yard in 2017, which ranked 32nd in the NFL. Their running game was painfully easy to stop when teams dedicated extra resources to doing so, as their backs averaged 2.2 yards per carry against loaded boxes (more defenders than blockers). The Seahawks have swung the axe plenty of times over the years in an effort to fix the front five, but they're due for yet another chop here in 2018. Solution: The 'Hawks created more needs for themselves by starting a pseudo rebuilding phase this offseason, but they still must sink multiple draft picks into the offensive line. The team traded for Duane Brown in the middle of last year and will hope for progress out of Germain Ifedi at right tackle. Nevertheless, more competition is needed on outside spots of the line. Don't rule out a tackle at the 18th overall pick coming in to move Ifedi to another position, or that the team just drafts a guard there. The Buccaneers' passing offense didn't take the leap many expected in 2017, but an ineffective ground game was also a culprit in the team's disappointing campaign. Doug Martin returned from an early-season suspension as more of an anchor than a lifeboat tossed to a sinking running game. Tampa Bay's running backs averaged 3.17 yards gained after defenders close within 1 yard last season, ranking 31st in the NFL. No one on the team could evade tacklers. On the other hand, the Bucs' offensive line posted the 10th-highest average yards gained (0.35) before defenders closed within 1 yard of their backs. Thus, an ecosystem exists for a productive running game in Tampa Bay. Solution: A long-shot scenario exists where Saquon Barkley is still on the board when the Bucs pick at No. 7. If he's there, he'd be a near impossibility to pass up and would bring the added benefit of his receiving chops to the team. It's more likely Tampa finds its man in Round 2 or 3. The top of the second round will still hold a bevy of tempting options in what is a strong class of runners. Washington checked in as Next Gen Stats' second-best pass-rushing team by collecting 269 total pressures in 2017. However, for as good as the 'Skins were against the pass, this front seven is in desperate need of some players to assist against the ground game. The Redskins ranked 23rd with 199 run stuffs overall last season and were particularly weak both inside and out. The team ranked 30th with a 12.5 percent interior run-stuff rate and 32nd with 11.5 percent on the edge. Washington should be on the lookout for front-seven help throughout next month's draft. Solution: Massive lane clogger Vita Vea out of the University of Washington would be the crown jewel if he slips to the 13th overall pick. If he doesn't get there, Washington might chase someone like Harrison Phillips, who rounds out Mike Mayock's top five interior defensive linemen.